Mom’s are usually born with a library of remedies passed down from, well, who knows where. Being born into a family that has always been bent towards homeopathic medicines and remedies, I’ve come across the strangest solutions for even the most common illnesses. One of these, though certainly not the strangest, is the belief that eating plenty of carrots will improve weak eyesight or nearsightedness. From my grandmother to even small community doctors, I was always been told that eating more carrots will improve my eyesight and eventually get rid of my glasses completely. Sorry to break it to you, but carrots do not ‘improve’ your eyesight and I can back that with the fact that I was fed plenty of carrots when I first wore glasses. For those of you that don’t want to jump into the details, basically eating carrots can help those that are Vitamin A deprived, and like any other recommended vegetable does help in preventing vision loss, to some extent. Carrots do, however, contain beta carotene, which can help improve or prevent conditions such as xerophthalmia or drying of the cornea and can also be transformed into rhodopsin, which assists in nighttime vision. Once more that’s only if you lack Vitamin A in the first place. So where did the myth originate? One possibility is the heavy campaigning that took place for the vegetable by the British government and airforce during World War II. The British government didn’t want the Germans to know of their newly acquired radar technology, so instead spread the word that eating plenty of carrots was what was helping their pilots see at night. 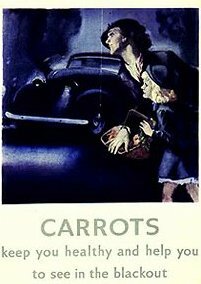 The propaganda was further fueled by the over emphasis placed on the importance of carrots to one’s health. And you ask why carrots? Well, Britain was facing a major food scarcity and carrots were one of the most abundant and cheap vegetables around. Carrot fields sprang up around the country very quickly during the campaigning. All of that led to a big part of today’s myth, that carrots can heal your vision. Carrots, vegetables, and many dietary supplements contain provitamin A carotenoids or beta-carotene which your body converts into Vitamin A. Beta-Carotene has a variety of health benefits which can include prevention against cancer and heart disease, helps to boost immunity, and assists in the prevention of cataracts. Studies show that myopia commonly known as nearsightedness is usually caused by environment factors and not by genetics. Constant stress to the eyeball caused by computers, reading, and focusing on close objects causes it to elongate. Once elongated the eye has trouble focusing on distant objects. The only way to fix this is laser surgery or by wearing glasses/contact lens, carrots play no roll in lens correction. They myth is alive because of its historical background and the fact that it has helped individuals that are Vitamin A deficient. On the other hand, too much vitamin A can become a harmful toxin for the body. Studies conducted on nepali and middle eastern citizens, that are vitamin A deficient have proved that a sufficient increase in the vitamin has helped individuals see clearer in the dark, but does only that. Carrots have never been a factor in decreasing nearsightedness or improving eyesight in general. There is some merit to the old saying, “eat your carrots or you’ll go blind.” Carrots are an excellent source of beta-carotene and problems with the eyes are one symptom of a deficiency of beta-carotene. However, there are other sources of beta-carotene that offer a sufficient source of nutrients. It shouldn’t surprise you that vegetables and fruits are your best source of beta-carotene..